Pinot Noir by Mount Pierrepoint of Henty. Powerful yet refined, seductive plush flavours greet the palate, an array of red and black berry fruit flavours are matched by finely grained tannins. From an organically farmed, biodynamically managed vineyard, a salient expression of western districts Victoria Pinot Noir, having claimed a succession of significant awards at the hotly contested, national competition of Boutique Wine Makers. Major Thomas Mitchell, Surveyor-General of the colony of New South Wales, named Mount Pierrepoint after Major Charles Pierrepont who served with the 26th Regiment of Foot and fought in the Napoleonic Wars. Mid palate fleshy richness, generosity and length. In an unpublished paper, "British Military Map-Making in the Peninsular War", a paragraph explains the connection between Major Mitchell and Major Pierrepont: "The famous topopgraphers, Bainbrigge (Mount Baimbridge is located north of Hamilton), Mitchell, Freeth, Pierrepont and Colleton, to name a few, were among the early graduates of the first army educational system to be introduced to this country." 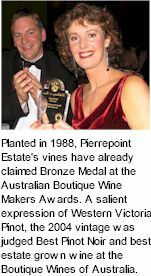 Mount Pierrepoint Estate was established by Andrew and Jennifer Lacey in 1998. The Estate is a small family owned and operated vineyard and winery, located 10km southeast of Hamilton in the Henty winegrowing region of Victoria. The vineyards are situated on the foothills of Mount Pierrepoint between Hamilton and Tarrington at an altitude of 200m and an average rainfall of 700mm. The first vines to be planted were Pinot Noir, and subsequently Pinot Gris and Chardonnay vines have been planted. The predominantly red buckshot soils of the vineyard are derived from ancient volcanic basalt which is rich in minerals and is free draining. The vines are situated on a north facing slope, and are hand pruned and de-budded to ensure they are balanced to ripen the following season's fruit. Andrew and Jennifer's children, Alexandra and Nicholas, are being raised on the estate, and are involved in all aspects of grape growing and wine making. The philosophy is to allow nature and seasonal variations to be expressed in the wine. Intervention is kept to a minimum enabling the natural character of the fruit to be developed over a 12 month period in french oak barrels. The fruit is estate grown and managed for low yields of up to 1.5 tonne per acre. The grapes are hand picked, de-stemmed and fermented in open stainless steel vats. Utmost attention is given to the juice during fermentation including regular, day and night hand plunging. The wine is then very gently basket pressed and placed into a balanced proportion of new and old french oak. 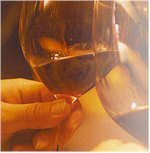 Malolactic fermentation occurs naturally during Spring after which the wine is lightly sulphured. The finished wine is selected as the best blend of barrels; it is bottled just prior to the following vintage and released approximately 6 months later. Mount Pierrepoint Estate was excited about the release of Pierrepoint 2005 Pinot Noir. Pierrepoint 2005 recieved a rating of 91 in the James Halliday Wine Companion 2008, along with the following description of the wine: "Plum, Blackberry and traces of spice and forest flooor, a long, brisk finish, time still to go." It was awarded a Bronze Medal at the Australian Boutique Wine makers award conducted in Sydney. The previous 2004 vintage was judged Best Pinot Noir and best estate grown wine at the 2005 Boutique Wines of Australia competition.